Japan has a compelling story to tell, and a new generation of Americans is ready to listen. Shinzo Abe recently became the first Japanese prime minister to address a joint session of Congress. He was keen to emphasize that Japan’s democracy came from America and his message of shared democratic values was both clear and disappointingly superficial. It was less obvious if Abe, or other Japanese leaders, understand the generational opportunity they have to use Japan’s cultural resonance with Americans to create a political bulwark of support for his country here in America. On a recent trip to Japan with a group of young professionals in foreign policy careers, we were on our way to tour a sophisticated manufacturing facility when our bus passed the headquarters for Nintendo, right down the street. Needless to say, many of us would have preferred that tour instead. Japan has made significant and undeniable inroads into American culture, and while older generations of Americans – the greatest generation and boomers in particular – have experiences that may bias them against a stronger relationship, Gen-X-ers and those younger harbor no such resentments. 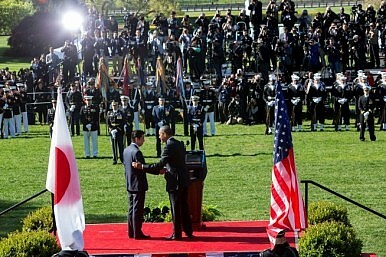 Japan and the United States’ strong military and diplomatic relationship was largely built on security imperatives. For decades Japan was our Pacific stalwart, a firm-standing guard against communism in a region of supposed-dominoes. Today, it is the front line against potential Chinese aggression on the seas and home to strategic American bases. Renouncing war herself, we extended our protection to the nation just hundreds of miles from the shores of China and North Korea. Japan became our base in the east and we her protector. For policymakers, it was a good trade. Yet the general public’s view of Japan has been more complicated. The World War Two generation, increasingly disappearing today, was unlikely to feel an affectionate connection to the country they fought from Pearl Harbor to Iwo Jima. An occupier’s mindset and the cultural gulf between 1950s America and postwar Japan didn’t help. Even today, a third of Americans cite the war as the most important event in the U.S.-Japan relationship. The boomers may certainly have inherited that lingering suspicion and the economic challenges of the 80s and early 90s didn’t help feelings. The Japanese car industry put Detroit into a panic while Asian investors bought up real-estate and companies – Americans feared the so-called “Japanese miracle,” and U.S. positive opinions about Japan didn’t bounce back above 50 percent until 1996. The contrast with today’s younger generation is stark. They grew up playing Nintendo, racing Mario Kart, and catching all of the Pokémon. They were mesmerized by the Power Rangers in their living rooms, and later sat petrified in movie theatres watching U.S. remakes of Japanese horror films The Grudge and The Ring. Today, tens of thousands attend cosplay conventions dressed as popular Japanese anime characters. College kids live on instant noodles, and D.C. yuppies wait in line for two hours at ramen shops – all while we as a nation eat more sushi than Japan does. And of course, owning a Toyota Prius is as much a political statement as a way to save on gas. Without the same historical hangups, the next generation of American leadership is incredibly familiar, conversant, and comfortable with Japan and Japanese culture. It is a strong example of how the interconnectedness of the 21st century is changing opinions and melding cultures. This shift represents a significant opportunity for the island nation’s political leaders, who rightly worry that America’s combined fiscal and Middle East misadventures will prevent the investment in Pacific power necessary to legitimate the security alliance. America’s strongest alliances have always been built around cultural connections rather than security or policy necessity – the U.K., Germany, and Israel all share deep historical or immigrant experiences with Americans. And as the Pew Center’s consistently excellent polling on international issues shows, Americans are ready to cement that connection with Japan. A strong pro-Japan lobby within the United States would be essential to that effort, yet while other countries have well-organized advocacy and public relations campaigns focused on everyday Americans, Japan seems to have focused on the beltway. Japan has a compelling story to tell. Hopefully Japanese leaders see this generational opportunity beyond the topline numbers and are ready to exploit it with a new public affairs strategy. David Solimini is a Fellow of the Truman National Security Project and an independent consultant. The views expressed are his own. Follow him on Twitter at @CommsDirector.